We do understand it is difficult to go from door to door advertising your beauty salon. The mouth of word advertising will surely do its trick, but you should not stop doing your part. 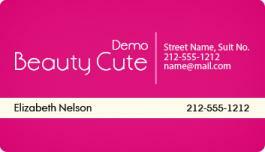 You can spread word about your business with these 2x3.5 custom printed beauty salon business card magnets 20 Mil round corners. These personalized beauty spa salon magnets will guarantee that your contact information will never leave your customers line of sight. They are such a great giveaway item that you can pack them for niche tradeshows or community events. Order today to get started at the earliest with these promotional magnets at guaranteed low prices. Request a quote to know price cuts that you can avail for wholesale 2x3.5 Custom printed beauty salon business card magnets 20 Mil round corners.